I love pretty much anything with cinnamon/sugar on it. I was trying to think of something to make for my kids (and some of their friends) for an afterschool snack the other day and remembered how yummy cinnamon sugar tortilla chips are. So I made some...and they disappeared really fast..
Spray both sides of the flour tortillas with cooking spray, (I sprayed the top of mine with I can't believe it's not butter spray too). 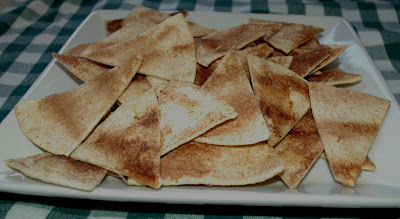 Sprinkle one side of tortilla with cinnamon sugar. Stack tortillas and cut in 8ths (or cut them individually with a pizza cutter). Spread tortilla chips onto cookie sheet, so they're not touching. Bake at 350 for 10-12 minutes. Yummy plain or with fruit salsa.